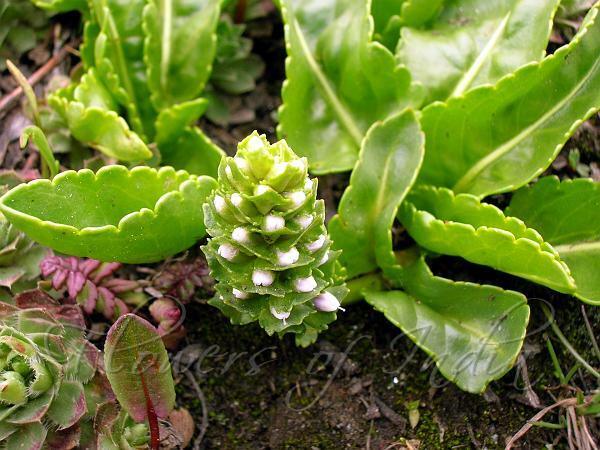 Kinnaur Lagotis is a perennial herb with flowers white, pale mauve or blue, numerous. Flowers are often only a little longer than the elliptic, densely overlapping bracts, in a very dense spike, borne on short stem arising from the root. It is a very variable species both in form, shape of the leaves, and color and size of the flowers. Spikes are 4-10 cm long. Flowers have slender tube up to 8 mm long, 2-lipped, with strap-shaped, out-curved petals, or petals short, rounded. Sepal cup is spathe-like. Leaves are rather fleshy, 5-15 cm long, mostly basal, narrow-elliptic to obovate, entire or with blunt teeth, stalked. Stem leaves are bract-like, stalkless, progressively smaller above. 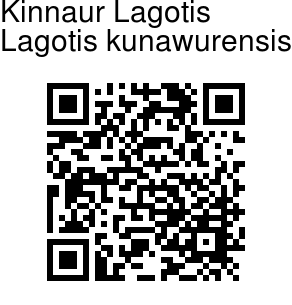 Kinnaur Lagotis is found in the Himalayas, from Pakistan to SE Tibet, at altitudes of 3900-5600 m. Flowering: June-August. Identification credit: Krishan Lal Photographed in Sirmaur Distt, Himachal Pradesh & East Sikkim.